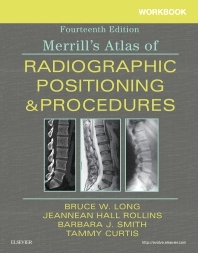 Get the most out of your Merrill's Radiographic Atlas with Workbook for Merrill's Atlas of Radiographic Positioning and Procedures, 14th Edition. Correlating with chapters in the main text, this workbook concentrates on the essential terminology, anatomy, and positioning information entry-level radiographers need to prepare for the ARRT exam and thrive in the clinical environment. This new edition provides detailed practice and review exercises including labeling, anatomy identification, short answer, multiple-choice, matching, true and false, fill-in-the-blank, error identification, and more. Exercises on identifying errors on radiographs prepare you to evaluate radiographs in clinical situations. Wide variety of exercises provides a variety of interaction with the content. Abundance of labeling exercises ensures you recognize anatomical structures on actual radiographs. Comprehensive self-test at the end of each chapter enable you to accurately gauge your comprehension of the material and measure your own progress. Pathology exercises help you understand which projections will best demonstrate various pathologies.